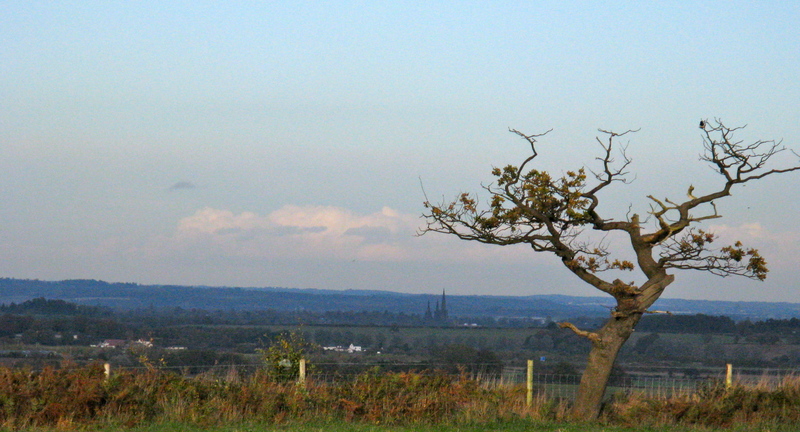 I’m very near the edge of the parish of Aldridge, in the November dusk – looking north-east from the rise which is “Lazy Hill”. To the left, out of view, is the bosky mound of an Iron Age Fort. Beyond it, and behind me, are the sites of former collieries. Dominating the middle distance is the triple spired cathedral of Lichfield. The fields and hedges of Stonnall, Shenstone, Lynn and Wall lie between. They are changed, but perhaps not unrecognisably so, and wandering ghosts of the last several hundred years could still find their way home down the deep lanes. What a touching thing it is to have sight of the census return forms from the middle years of the 19th century, when the enumerators knocked on the cottage doors of my ancestors in this same landscape. I imagine that I can hear the very voice of my great great great grandfather William Horton, mason, of the hamlet of Lynn, speaking his response to the well dressed, literate stranger – his name is recorded in 1841 as “Orton” and not “Horton. Born in 1796, he may not have had the opportunity to learn to read and write – even his own name. Or perhaps the enumerator simply wrote down the aitchless word he had heard, and the humble man did not have the confidence or the interest to correct him. “Ag Lab”, or “Mason”, “Bricklayer” or “Nailer’ were frequently jotted in the column headed “Occupation” on these visits. There was some diversity of the manner in which my father’s family earned their living, but most were bound to the agricultural industry. Horton families were large, no doubt wages were small, but thanks to the geology and customs of the area, the cottages were brick built, weatherproof, and substantial enough. 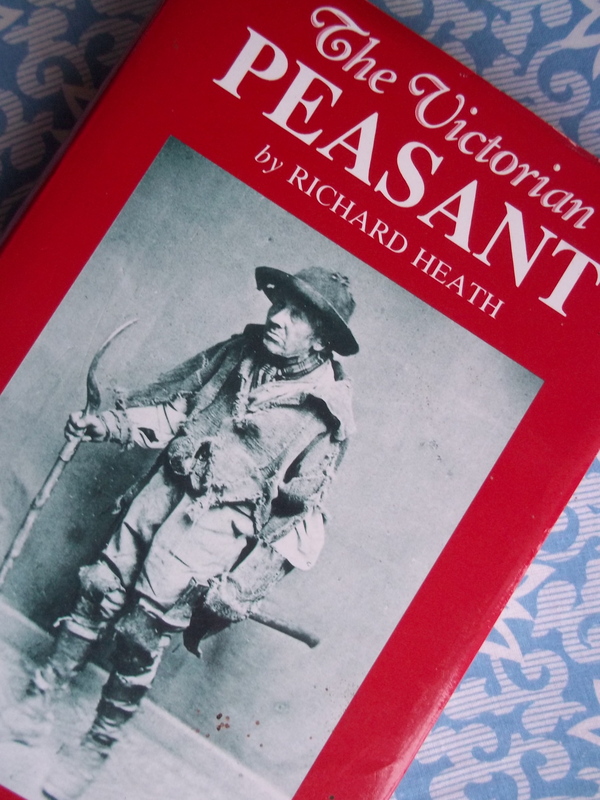 Of all the counties which Richard Heath toured in the 1870’s, chronicling the poverty and degradation of the lives of the rural working classes, Staffordshire does not get a mention. Did these good, warm-red brick cottages provide him with no sensational tales of hardship? The talk in Heath’s articles is all of damp, crowded, vermin-infested cob and thatch. Nevertheless, the assertion that “in the process of modern civilisation, the English agricultural labourer has been the constant loser” is as applicable to South Staffordshire as elsewhere. When coal mining began in earnest at the Walsall Wood and Aldridge collieries, the newly dug shafts seem to inhale deeply, and draw in the sons of the soil from surrounding villages. Living conditions in the “Buildings” and “Rows” clustered around the collieries may have been poor, but it was the comparatively favourable wages which enticed men. Obviously, there are other considerations than wage levels when choosing a job. In Yorkshire, my late father-in-law told his three sons: “I’ll break your chuffin’ legs before let you go down that pit.” And none of them did. Ken, my husband and his youngest, born 1943, quite contentedly started work as a farm labourer on 60 shillings a week. Mr Ward senior had loved, as a young man, his work with the draft horses on the farm. But fatherhood and family pressure cajoled him into a 40 year symbiotic relationship with The Colliery. Here, to Clifford Ward, were offered wages more fit to keep his inexorably growing family on, in return for his health and most of his waking hours . “Double’uns” were available, and so 18 consecutive hours could and would be worked on weekdays, high-days, and holidays. By the turn of the 20th century, the “Occupation” column of the census returns of my father’s family are sparsely interspersed with “brick maker”, but overwhelmingly dominated by “miner”. We know that my grandfather, Alfred Noah Horton, just like his cousins and second cousins, and third cousins in Walsall Wood, was coal mining at the time of the 1911 census. He was rejected from army service in the Great War because of a missing eye. Was he then obliged, I wonder, reluctantly to continue in the pit for the duration of the war? His eldest child, my Aunt Mary, looked back to around 1918, and remembered him working in the sandpit at Shire Oak. Later, she describes him as working in the building industry, which is what I understood he had done. We moved into Number 1, a shop. We sold fruit, veg. and think we sold fish. A stone had made a small hole in the thick glass window large enough for me to pass nuts through to a girl named Flora James. The people next door had a fish and chip shop, they closed and we had the fryer from them. All the miners used to come in in their pit-black, buy fish and chips, then stand in the shop and eat them. As the miners all came off the afternoon shift , that meant 10.30 at night – and I saw them – goodness knows when I went to bed . Mother went into Walsall on the first tram to buy fish ( and ice at week ends) that’s when she made ice cream which was sold from a sort of churn fixed to the front of a bike. A man sold that, she sold it from the shop. When she fetched the fish and ice I had to take the pram down to meet the tram at the terminus where the conductor always helped to load up the pram. The same pram went to help her carry her bags. My grandmother Lizzie’s father Enoch Blann was dead by now, and no “pit coal allowance” meant that other means of obtaining fuel was necessary. Young Mary and her little brother Bill made use of any available resources to help the family keep warm. Bill and I and a few other kids went down to the brickyard ash tip taking sacks with us to pick cinders for free firing. Sometimes the ashes came straight from the brick kilns and very hot. Had a fight with a boy who was ” picking on” Bill. He pushed me down the cinder bank – I burned my arm At times the scar shows up. There was a time round about the big strike when there was no food or coal. Our mother, me, Mrs. Pinches and her son called Bach-y about my age went down to the Dry Bread Colliery in the dark. The mothers put us into a coal wagon to pass out lumps of coal which they put in bags, We were lifted down and proceeded carefully back to the road. Us kids got under a field gate and the sacks were put on our backs. The mothers walked on the road, us kids walked on the other side of the hedge, coal on our backs. By the time we had walked along two sides of the field I felt my bottom was almost touching the ground. The mothers carried the bags when we got nearer the houses. Once home coal was heaped on the few sticks. During that time we only had fires after dark – all colliers coal allowance had gone coal smoke from our two chimneys would have looked suspicious. I love the way you are linking all your sources and painting word pictures. You really have the ability to evoke another time… JOLLY WELL DONE!… I am so proud of you… you are a better writer than Mum and me put together. I am so enjoying these posts, I do hope everyone else is too. That’s not true, Ros….as everyone will especially see when I start quoting from your PUBLISHED books! I appreciate the compliment hugely, though! Meant to comment on the superb idea of the pit shafts breathing in the agricultural workers… inspired ! .. oh ….yes… in 2 senses of the word!!!.. Maybe you’re related to Joe Orton? Thanks for reading me, though. Loving all this, you manage to make it very real. Absolutely brilliant !! Makes it even more worthwhile in that “Aunt Mary’s memoirs” of the Vigo coincide with my own memories. I remember the “coal picking” Mrs Pinches and son Bach. After leaving Aldridge Road they moved into the Council houses in Salters Road, near to Vigo corner, having another son and three girls. Mrs Pinches, always active and hardworking, lived to a ripe old age. The old house at No 1, became a fish and chip shop in the early ‘thirties and was active for many years. Flora James could probably be the daughter of Mr. James who kept a shop lower down in the same row. This shop has featured in an old photo in Brownhills Bob’s Blog. I remember many colliers from “Drybread”. King Hayes farm was “Wilkins’s” where many of the locals would buy milk. I well remember the R.O.A.B Orphanage, opposite Birch Lane, being a “Buffalo” myself. I was born in 1931, so “Aunt Mary’s memoirs” go back farther than mine, but I am so thrilled to know that a little bit of “Old Vigo” memories are still retained and in such a lovely textual setting, Sheer delight !! Thank you David. Your information is fascinating, and I am gratified that you enjoyed reading my blog.